“Offal is still not a hugely sought after item, but when people do request it, it’s usually liver that they are after,” say Erica and Amelia (see photo), the tag team behind Lindy and Grundy butcher shop in Los Angeles. If anyone knows what’s in demand in the meat world it is the butchers ” the masters behind the meat, the all knowing suppliers of prime cuts. At the heart of a great piece of meat is the hand that skillfully guides the knife that cuts it. This expertise comes into play particularly when butchering whole animals. 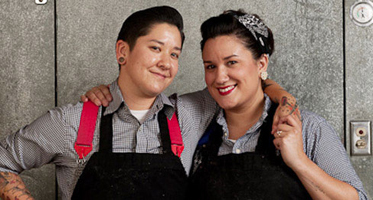 Erika Nakamura and Amelia Posada are committed to practicing nose to tail butchering and providing both patrons and chefs alike with local, pastured and organic meats. Erika and Amelia source from farms that are dedicated to meat sustainability and raising 100% organically reared animals. To get the best of the best, they source from various farms outside of LA and in Northern California. Their pork comes from ReRide Ranch in Lake Hughes while their beef comes from Stemple Creek in Marin County and Rancho San Julian in Lompoc. They also get their lamb from Stemple Creek. With the exception of some glands and sinew, you can guarantee that every animal brought through the doors of Lindy and Grundy is used to its fullest capacity. Out of the least demanded parts like the offal (kidney, liver, heart, etc.) they make house terrines, pate and even dog food. Butchering whole animals is a trade requiring attentive training and practice. In contrast to some shops that receive packaged meat, Lindy and Grundy only receive whole animals. They are delivered on an in-house rail system and butchered every day. Erika and Amelia also host butchery classes in house and sometimes in the homes of patrons. They also offer an apprentice program. They pride themselves on being an old fashioned butcher shop that supports the endeavors of the little guys, the small family owned farms that raise quality meat.